419 mm/45 Mk II4 х 3 pcs. Initial AP Shell Velocity747 m./s. 134 mm/50 Mk I8 х 2 pcs. 40 mm STAAG4 х 2 pcs. 40 mm Bofors Mk VI11 х 6 pcs. 457 mm/45 Mk II4 х 2 pcs. Conqueror — British Tier X battleship. Perched atop the British battleship tech tree at Tier X, Conqueror is a worthy successor to Lion. Like Lion, Conqueror can sneak around the map by taking advantage of her low detectability range, which is among the lowest of all Tier X battleship's, even beating that of a Hindenburg fully kitted out for concealment. Her size means that she will take quite a few hits in a gunfight. As such, it is important to position properly and use concealment when faced with overwhelming odds. When this isn’t possible, Conqueror is capable of holding her own. Her high-explosive (HE) shells are extremely powerful and sport a high fire chance. This is useful when engaging multiple ships because she can burn her enemies at range and switch to armor piercing (AP) for more devastating hits at close range. However, her HE shells are powerful enough that some captains may choose to use it exclusively. After slugging it out with the other heavy hitting ships at Tier X, Conqueror can use a Repair Party ( ) consumable which is capable of restoring tens of thousands of hit points (HP). This allows her to stay in the fight, continuing to punish her enemies, but she is still relatively fragile if she is unable to disengage and heal. Conqureror’s anti-aircraft armament, while powerful for self-defense — especially the mid-range ring — is concentrated into a relatively small number of mounts, meaning it can be disabled fairly quickly. By combining her strengths and finding support from friendly ships, Conqueror becomes one of the most powerful ships in the game. Excellent AP and HE shell performance. Conqueror is capable of destroying her enemies at any range. 457mm gun option gains an accuracy boost. Highest AP shell damage in the game (when equipped with 457mm guns). High HE fire chance means that a salvo with multiple hits almost guarantees a fire, making her extremely effective against aircraft carriers. Armor-piercing shells have short-fuse, allowing for less overpenetrations on cruisers, aircraft carriers and destroyers. Amazing concealment, rivaling most cruisers and even beating some. Conqueror can sneak around a flank or disengage in order to repair the damage she has sustained in battle. Access to the same crazy Repair Party ( ) consumable found on high tier British cruisers, capable of repairing huge amounts of damage. Very low citadel means critical hits are extremely rare, even when broadside. Excellent anti-aircraft suite. When fully specialized for it, Conqueror is capable of shredding enemy aircraft. Solid handling characteristics. With an above average stock rudder shift time and turning radius, Conqueror is capable of outmaneuvering Montana and Großer Kurfürst. Yamato has a smaller turning radius but has a slower rudder shift time. Despite a thick armor belt that is capable of stopping small-medium caliber shells, Conqueror is susceptible to high caliber AP shells at certain angles. Even though her citadel sits low in the water, it is poorly armored: only 76mm. No protection against HE shells; her entire deck is basically unarmored besides the minimum armor for the tier. Same short-fuse on the AP leads to poor performance against battleships at medium-to-long range. 457mm gun option is still unreliable to hit targets, even with the boosted accuracy, due to less shells being fired per salvo. Conqueror is a massive ship, which makes it hard to operate in close quarters. She is also a large target for enemy destroyers to hit with torpedoes, combined with the fact she has very poor torpedo protection compared to other Tier X battleships. Slower than Großer Kurfürst and Montana, though not by much. Health pool is the lowest among all Tier X battleships; however, she is capable of restoring large amounts of HP with her Repair Party ( ) consumable, but this consumable has a longer-than-normal cooldown and has a smaller number of charges than normal, with only 2. Even when fully specialized, Conqueror’s secondary armament is underwhelming due to its sluggish reload and low firepower. Conqueror has her anti-aircraft armament concentrated into a relatively low number of mounts that are grouped on her superstructure, leading to many of them becoming incapacitated fairly quickly by high-explosive shells from enemy ships and making its high initial DPS a bit deceptive. Lacks access to either Spotting Aircraft ( ) or Catapult Fighter ( ) consumables. Conqueror has one researchable upgrade for her main battery. The stock gun configuration is four (4) turrets with three (3) 419mm rifles each. By researching and upgrading, her configuration changes to four (4) turrets with two (2) 457mm rifles each. Her AP and HE shell damage is similarly increased and the chance of fire for HE shells ticks upward. It's difficult to recommend investing in the 457mm guns. 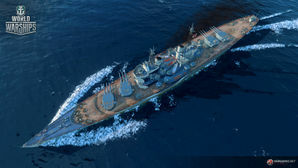 Some players may wish to purchase the upgrade in order to engage battleships more readily, but the small difference between Conqueror’s 457mm shells and Yamato’s 460mm ones is significant due to the way the armor overmatching mechanics work in World of Warships: Conqueror’s 457mm shells cannot automatically penetrate the bow armor of every other ship in the game the way Yamato can. This is not to say that they are bad, only that the main advantage of Yamato’s guns of approximately the same size does not transfer to Conqueror. The upgrade however, drastically reduces Conqueror’s potential alpha damage by nearly 40,000 points. Also, since the stock guns have similar caliber to Großer Kurfürst’s upgraded guns with the same number of rifles as well as a better reload, it is mostly a better choice to stay with the stock guns rather than spend credits and experience on the upgrade. Upgrade Slot 1 provides a useful alternative to Main Armaments Modification 1. For players who wish to specialize for anti-aircraft duties, Auxiliary Armaments Modification 1 ( ) should be mounted. Upgrade Slot 3 provides options with different benefits. Aiming Systems Modification 1 is typically recommended for increased accuracy in long range gunnery. For increased turret traverse in a brawl, Main Battery Modification 2 ( ) is a useful upgrade. For specialization in anti-aircraft duties, AA Guns Modification 1 ( ) should be mounted. Upgrade Slot 6 provides two useful options for specialization in different roles. Main Battery Modification 3 reduces reload time, but there is a trade-off of increased turret traverse time. This upgrade is recommended for players who wish to specialize in gunnery. AA Guns Modification 2 ( ) increases the damage output of AA guns, and is the useful option for anti-aircraft duties. As with most battleships, commander skill points for Conqueror are best invested into skills that will keep her alive. Level 1's Priority Target, Level 2's High Alert, Level 3's Basics of Survivability, and Level 4's Fire Prevention all earn a recommendation on this basis. Other key skills include: Concealment Expert to maximize stealth; Advanced Firing Training to intensify AA gunfire; and Adrenaline Rush to get the most out of her main battery, particularly given how soft she is. Expert Loader at Level 1 is also a good place to consider investing a single point, given how attractive her HE shells are. Conqueror’s key strength is access to its powerful Repair Party ( ) consumable. The premium version of this consumable — Repair Party II ( ) — should be mounted, paired with the commander skill Superintendent in order to gain two additional charges with reduced cooldown time. Damage Control Party II ( ) should likewise be mounted to reduce cooldown time between uses. Players who wish to spend doubloons can equip Conqueror with Type 20 camouflage that lowers her detection radius, reduces the accuracy of incoming shells, reduces her repair costs, and increases the amount of experience she earns. Critically important signal flags for Conqueror include: India Delta ( ), India Yankee ( ), and Juliet Yankee Bissotwo ( ). Players are also encouraged to equip November Echo Setteseven ( ) to maximize Conqueror’s AA bubble and India Bravo Terrathree ( ) to keep her operational costs more manageable. Conqueror sails the open ocean while sporting the stock gun configuration. Conqueror aims at a new target with her upgraded guns. View from the bridge overlooking the bow and forward turrets. Conqueror's formidable anti-aircraft armament repels Aichi B7A2 torpedo bombers. Conqueror fires a salvo at an enemy Friedrich der Große. Conqueror burns Friedrich der Große with fires set by her HE shells. Conqueror sails in formation with a friendly Neptune. Conqueror sizes up with Großer Kurfürst. Conqueror in game is a hypothetical design created by Wargaming, based around the concept of building a large battleship around eight 457mm (18 inch) guns that were suggested for Royal Navy battleships in the early 1920's, before the Washington Navy Treaty stepped in. Therefore, the ship bears a few similarities to the historical HMS Vanguard, which was built using spare 15-inch barrels from WWI era ships. The 419mm guns were also proposed for 1920's designs, though these were a later addition to the ship during its development by Wargaming. The given date of the design or it's completion is 1949, making the lattice masts viable, unlike with Monarch. This also means that the AA suite of Conqueror is filled with late 1940's 40mm mounts like the sextuple barrelled Mk. VI 40mm Bofors and STAAG mounts for the 40mm Bofors. The name Conqueror is taken from the third of the cancelled Lion class battleships that preceded Vanguard. This page was last modified on 19 February 2019, at 08:59. This page has been accessed 130,894 times.